Two book reviews in one week! 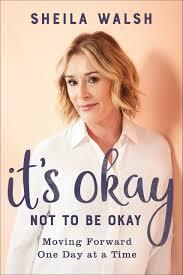 Today, we're looking at It's Okay Not To Be Okay, by acclaimed speaker, musician, and author, Sheila Walsh. "It's easy to fall; it takes courage to rise up and take the next step." This quote from Sheila's dedication really sets up the heart of this book: taking the next step. We all fall in life, and pretending we won't doesn't fix things; it actually makes them worse. You can't fake yourself well. Sheila calls for an honest, open-hearted pouring out before God. Only then, can we begin to find healing. And the goal is never to depend on ourselves alone. This is a process that is God-based, God-centred, and God-filled. What I really loved about this book is Sheila's compassionate, authentic voice. While sharing wisdom, she's also sharing her story and her heart. At one point I actually thought, "Yes, I'd love to hang out with this woman!" Her humour and transparency help guide you through a challenging but ultimately uplifting journey. This is a practical and inspirational book, but it's also an intimate journey of the heart. Many years ago, I experienced a long and difficult journey with grief that left me "not okay" for a long time. I think this would have been a great book for me to have read during that time. Right now, I know there are woman going through a similar time of "not okay."